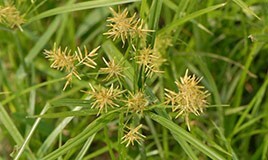 Brief Description: Highly intrusive sedge-weed, the Yellow Nutsedge actually resembles grass blades, but is thicker, grows taller, and has a tuber underneath that is edible. Yellow Nutsedge is a type of edible sedge. 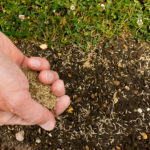 Beneath the ground it has a tuber, which is a small sack that stores nutrients. The tuber is edible, which is why some people grow nutsedge as food. 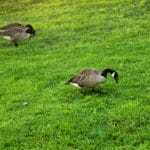 It is a perennial plant, and from the roots sprouts a group of leaves that look very much like grass blades but tend to grow much taller and interrupt the smooth green lawn you wanted. Yellow Nutsedge also sprouts small yellow spoke-like flowers. Yellow Nutsedge is considered one of the “Worst Weeds” because of how difficult it is to remove and how quickly it spreads. Tubers have to be removed in order to prevent nutsedge from spreading, and the tubers produce “nutlets” which are even harder to remove. The most important thing to do is clean any equipment used to cut nutsedge because the rhizomes from the yellow nutsedge stick to equipment and spread easily. 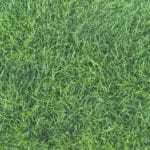 Unfortunately, once yellow nutsedge invades your lawn it often requires professional treatment. 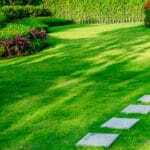 Find out how to get your green lawn back and rid yourself of yellow nutsedge with Green Lawn Fertilizing’s sedge control service. Contact us today to find out more.